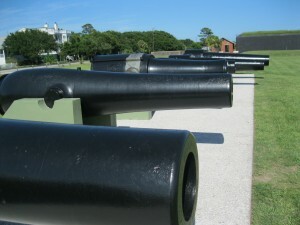 Among the many enjoyable things to do in historic Charleston is a visit to Fort Moultrie on Sullivan’s Island. The Civil War fortification is part of the Fort Sumter National Monument, and is administered by the National Park Service, and is one of the least expensive tickets in the area for a view of the old fort. There are also a number of displays near the fort that are absolutely free, such as the impressive row of seven giant cannons pictured, which stand just to the north of the old fort. These guns range in size, but are all part of the formidable weapons used in Charleston during the Civil War. The big, bottle-shaped Dahlgren guns are smooth-bores, which fired round explosives and solid shot, and were the most effective guns at the start of the Civil War. Farther down, there are rifled cannons, which were grooved inside the barrels to fire a bullet-like projectile that spun with more more accuracy than the wobbling round shot. The third one down is an especially unique gun, which was a Federal smooth-bore captured by the Confederates and converted to a rifled barrel. Because rifled guns fired for greater distance, they were equipped with iron bands around the breech to keep larger gunpowder charges from ripping the gun apart, and you can just see the makeshift bands on the rifled gun. These were done by a local Charleston forge, the J.M. Eason Co., which also built an ironclad ship in Charleston harbor during the Civil War. The Eason company markings can still be found on the gun, and all the guns have historic markings showing their muzzle sizes and places they were forged. The largest is a 15-inch Parrott Rifle, which could fire 200-pound explosive shells at distances more than 3 miles. This is a fascinating place to wander by just outside Fort Moultrie, and nearby, there are other guns from the Revolutionary War era, when the fist fort was built on this location. Less than 100 yards away is a path to the beach on Sullivan’s Island, which at this point overlooks Fort Sumter and Charleston Harbor, and is a wonderful stroll any time of day.